In my own understanding and based on a little personal research that I have conducted. I can clearly say that blogging community is a place where so many minded bloggers meet to share and read interested articles or post coming from other bloggers, share each others interesting and helping post and building a relationship with fellow bloggers in your niche or beyond.. It is very important to note how beneficial it is to join such a wonderful community . Benefits of joining Blogging Communities? There are so many benefits of joining blogging community among which I would love to share these main ones with you. 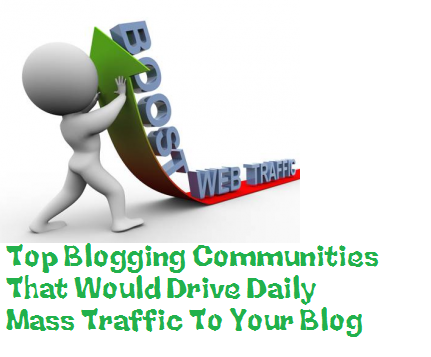 Blogging communities help your blog post to be highly ranked in the most popular search engines,and brings you a lot of organic traffic. You can freshen your mind with new topics and ideas to write or blog about from new post of fellow bloggers. Here are the most popular and effective blogging community that can be of great help....... meet bloggers in your niche and share ideas and post. BlogEngage is considered as a premium blogging community and as such goes with a standard price of £19.99 for a standard account. Know that it is worth investing. Dosplash, founded by Jane Sheeba. is a new blogging community among the others, it members are most of the top bloggers in the blogging industry so you easily get noticed anytime you share an interesting and quality content in the community. Your post can be featured in a slideshow for sometime if it is worth catching peoples attention. Members also gets the chance to interact with other co bloggers and that is one of the most important thing to note. ManageWP is basically a blogging community dedicated to WordPress and it is very fascinating how fast this community is growing. If you have any post or content related to WordPress+, ManageWP is a perfect place share it.... Impressive right ? The Writers social is highly know for it's ability to gain regular and constant hits to blogs sites, just like other bloggers you can also share your most interesting content here..
Bizsugar has been in the system for long and it is one of the oldest blogging community that I know of broadly used by top bloggers across the World. A large number of audience is assured when an interesting and quality content is being shared on board increasing your blog's visibility on Vote basis.